Big Finish’s Monthly Range experiment of releasing two two-part stories per release continues with ‘Vortex Ice’ and ‘Cortex Fire,’ paring Colin Baker’s Sixth Doctor with Lisa Greenwood’s Flip in two stories that sacrifice absolutely nothing in terms of ambition and personal drama despite their shorter running time. 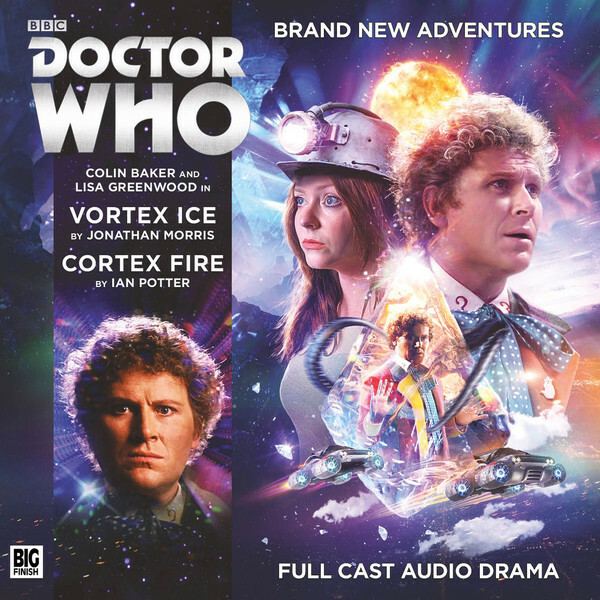 Jonathan Morris’s ‘Vortex Ice’ opens the double bill as the Doctor and Flip arrive in a mine far below the Mexican surface above while searching for exotic particles, quickly coming upon another expedition searching for alien life. The notion of vortex ice itself is fascinating and certainly worthy of further exploration and appearances should Big Finish ever choose to do so, and the truth behind the particles as explained is instantly intriguing and an immensely strong hook for any story. More importantly for the plot itself, though, is that together they give rise to a surprising amount of poignant- if somewhat despondent- reflection about those who travel in time and the potential consequences that can be incurred. Yet as the story becomes ever more complex and seemingly disparate threads are introduced while a mysterious menace puts lives in jeopardy, it’s Greenwood who anchors events as she proves just how strong Flip is both as a person and a companion beneath a sometimes flippant exterior as the puzzle slowly starts to takes form. ‘Vortex Ice’ is perfectly paced and expertly makes use of its small cast and claustrophobic setting to create a mesmerising story that will challenge and entertain in equal measure as bombastic action and deeper reflection blend seamlessly. Ian Potter’s ‘Cortex Fire’ takes the Doctor and Flip to the futuristic city of Festin, a place home to a truly unique astronomical phenomenon but also the unfortunante subject of nihilist attacks of terrorism. With citizens spontaneously combusting as they fight an overwhelming but unconscious urge to die under the governing network known as The Cortex, ‘Cortex Fire’ follows in its predecessor’s footsteps by exploring the thematic counterpoints of life and death and the acceptance of each in a given situation. A society and culture quite literally built upon a subconscious desire to die is boldly ambitious and could certainly form the basis of a traditional four-part tale, but Potter does well with first setting up the mystery of the nihilists and then concisely handling the fallout and ramifications of the discovered revelations. This is certainly- at least superficially- the more traditional of the two stories included in the release, but ‘Cortex Fire’ nonetheless takes some unexpected turns and dramatically thrusts the Doctor into the role of hero from which even he cannot escape unscathed. By necessity, much of the background is handled through exposition and some of the resolution takes place off-screen (as it were), but ‘Cortex Fire’ is nonetheless a strong concluding piece to the release and again proves how well the two-part format can be handled. The two-part format is a risky proposition in some respects, and many previous Doctor Who two-part stories have fallen victim to uneven pacing or failing to fully develop the settings and characters. However, Big Finish and its writers must be commended because, at least through four stories spanning two releases in the Monthly Range, ambition and imagination have meshed perfectly with the shorter running time, creating some of the most intriguing and well-paced stories in some time. With ‘Vortex Ice’ and ‘Cortex Fire’ both highlighting the strong chemistry between Baker and Greenwood as they explore the balance of life and death in very different means, this is certainly a release worthy of repeat listens.